Received April 5th, 2011; revised May 2nd, 2012; accepted June 6th, 2011.
predominantly secreted into the intestinal lumen by an efflux transport system. diffusion and is not polarized. ces are actively transported across intestinal epithelia. thione (GSH) were purchased from Sigma (St. Louis). solution were immediately introduced into the intestine. used in this study was 0.1%. type chamber that provided an exposed area of 0.75 cm2. the acceptor side at intervals of 10 min. of the membrane (0.75 cm2). at a level of p < 0.05. Each point represents the mean ±S.E. of seven experiments. 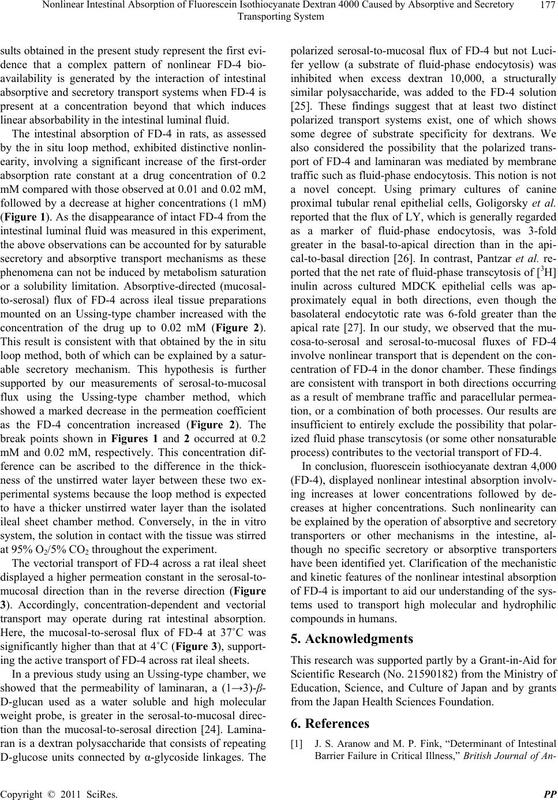 the I testinal absorption of FD-4. represent the data obtained at 37˚C and 4˚C, respectively. mg/ml, 50 µg/ml, 20 µM, 1 mM, and 10 mM, respectively. 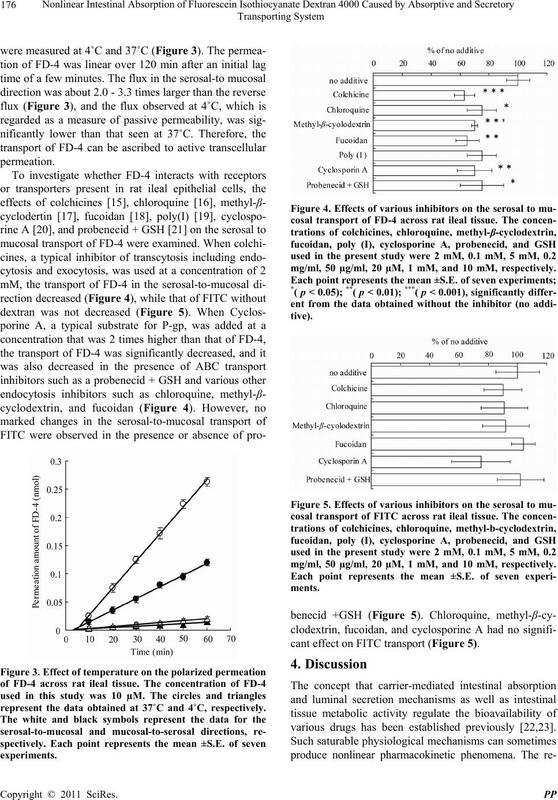 cant effect on FITC transport (Figure 5). 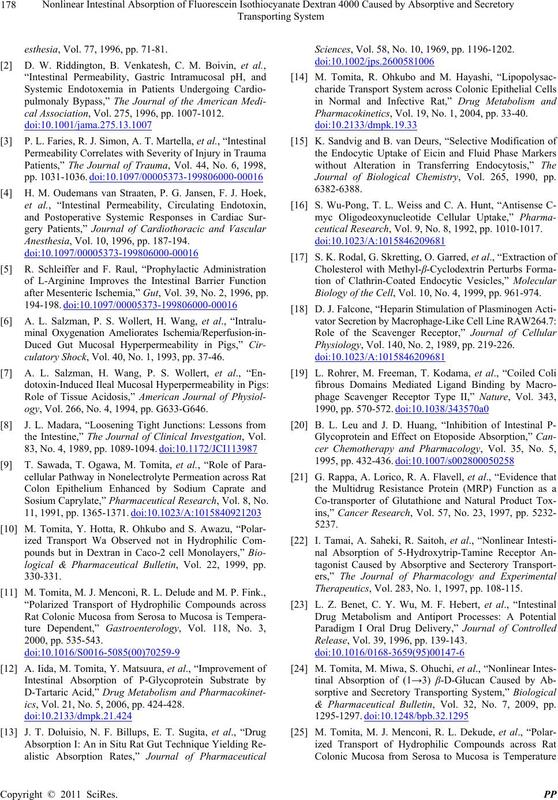 various drugs has been established previously [22,23]. 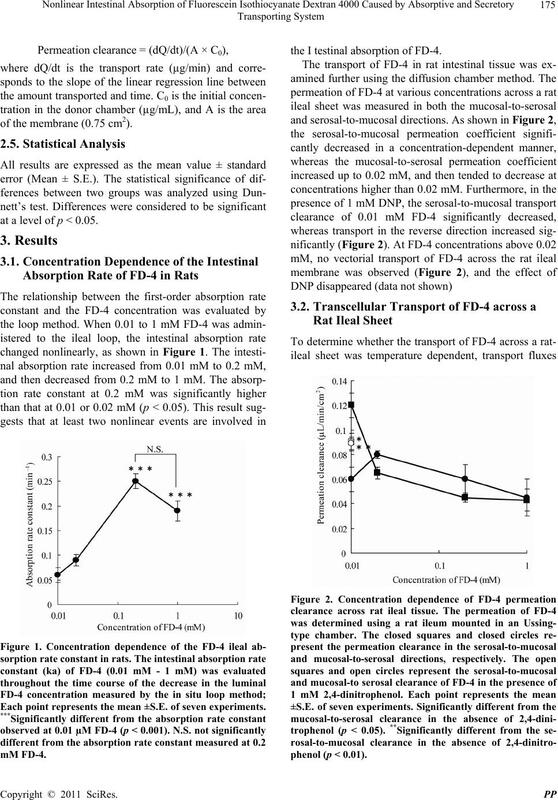 linear absorbability in the intestinal luminal fluid. concentration of the drug up to 0.02 mM (Figure 2). at 95% O2/5% CO2 throughout the experiment. 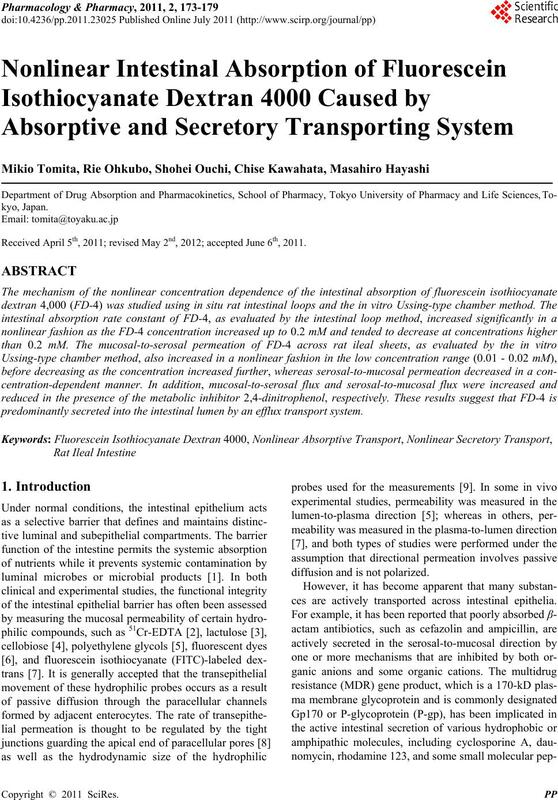 transport may operate during rat intestinal absorption. ing the active transport of FD-4 across rat ileal sheets. proximal tubular renal epithelial cells, Goligorsky et al. from the Japan Health Sciences Foundation. esthesia, Vol. 77, 1996, pp. 71-81.
cal Association, Vol. 275, 1996, pp. 1007-1012. Anesthesia, Vol. 10, 1996, pp. 187-194.
after Mesenteric Ischemia,” Gut, Vol. 39, No. 2, 1996, pp. culatory Shock, Vol. 40, No. 1, 1993, pp. 37-46.
ogy, Vol. 266, No. 4, 1994, pp. G633-G646. the Intestine,” The Journal of Clinical Investgation, Vol. Sosium Caprylate,” Pharmaceutical Research, Vol. 8, No. logical & Pharmaceutical Bulletin, Vol. 22, 1999, pp. ics, Vol. 21, No. 5, 2006, pp. 424-428. Sciences, Vol. 58, No. 10, 1969, pp. 1196-1202. Pharmacokinetics, Vol. 19, No. 1, 2004, pp. 33-40. Journal of Biological Chemistry, Vol. 265, 1990, pp. ceutical Research, Vol. 9, No. 8, 1992, pp. 1010-1017. Biology of the Cell, Vol. 10, No. 4, 1999, pp. 961-974. Physiology, Vol. 140, No. 2, 1989, pp. 219-226. 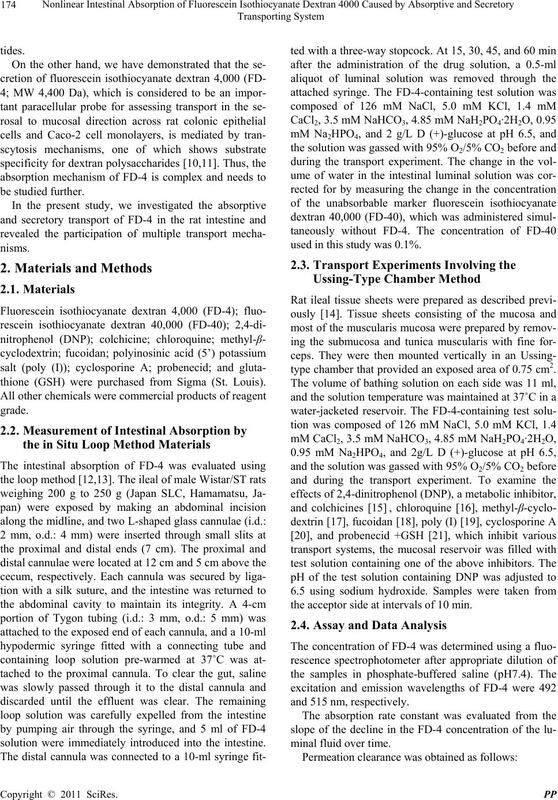 Therapeutics, Vol. 283, No. 1, 1997, pp. 108-115. Release, Vol. 39, 1996, pp. 139-143. & Pharmaceutical Bulletin, Vol. 32, No. 7, 2009, pp. Dependent,” Gastroenterology, Vol. 118, No. 3, 2000, pp. Biology, Vol. 93, No. 3, 1986, pp. 237-247.
of Gastroenterology, Vol. 29, 1994, pp. 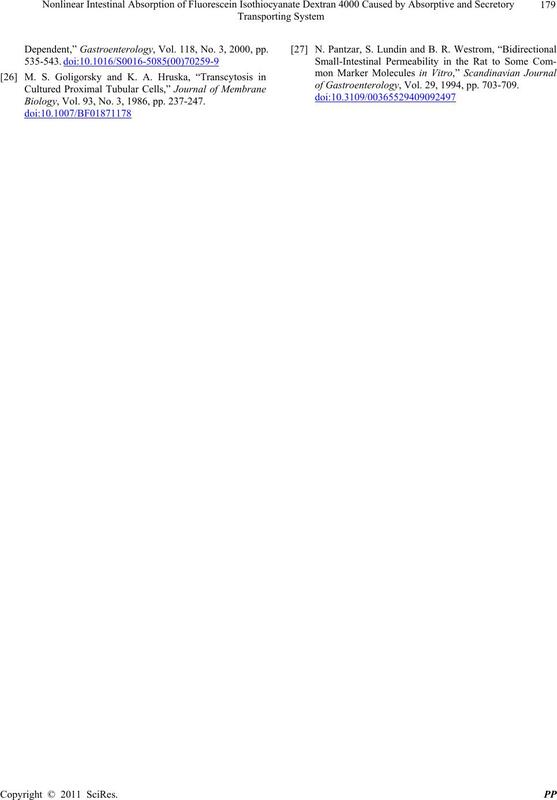 703-709.